I’m linking up again this week with The Girl Between the Lines. I found today’s prompt to be very difficult for me. The prompt is: “Share one of your favorite photos and the story behind it.” Well, asking me to pick out a favorite picture is just way to hard, and especially one with a story. One of my favorite parts of organizing these family photos into albums recently is remembering my childhood. Adam and I were looking through the albums the other day and I was telling him stories behind the pictures. Sometimes my favorite pictures don’t really have stories behind them, they were just taken of life happening, and sometimes that’s the best of all. I have picked out a few of my favorite pictures with stories to share with you because I couldn’t pick just one. 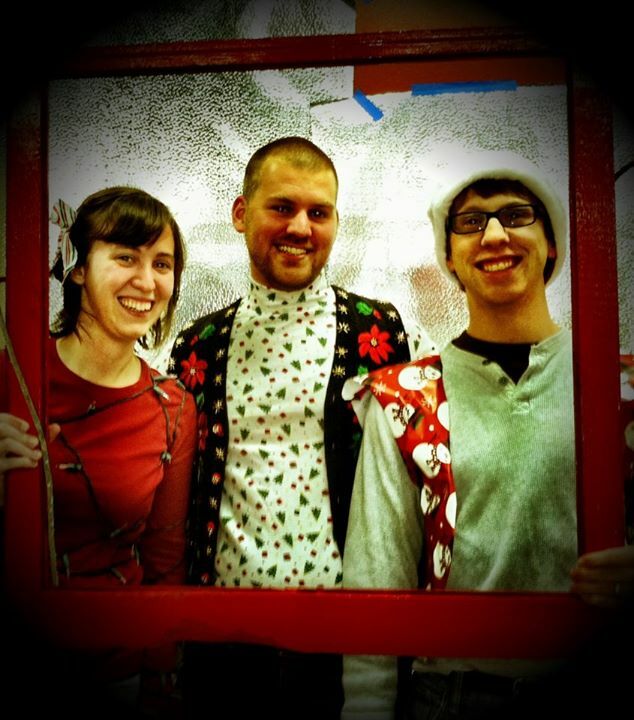 This picture is from sometime in high school with some of my very good friends from church: Ellis and Lauren. 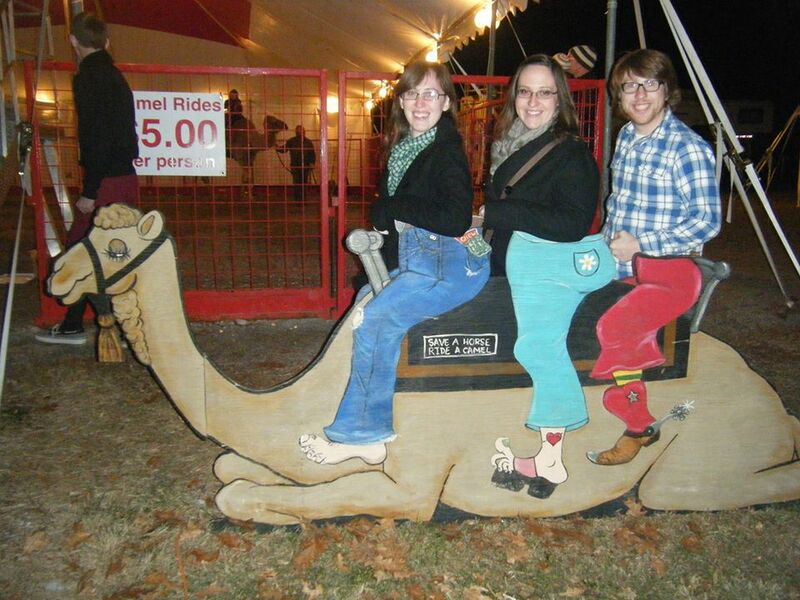 This picture was taken at our church’s trunk or treat. We knew that we wanted to go, but we couldn’t figure out what to go as. 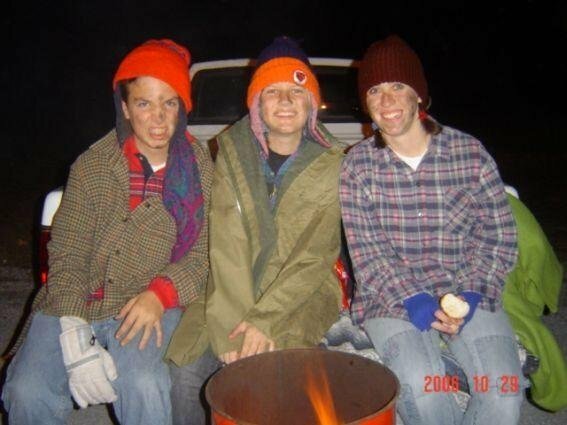 So we went as the easiest costume ever: hobos. It was a very fun night, even though the kids were too afraid of us to come and get candy. This picture was at a cookout the summer between my sophomore and junior year of high school. That was just a fun summer to begin with. 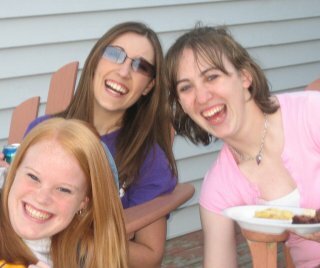 These are two of my best friends from high school and I remember that right before this picture was taken I had been choking on my hamburger and Kylee and Karie had just been laughing at me, and I had started laughing, making me choke more. I just remember this summer and this party being full of laughter and that is what this picture reminds me of. This is one of my favorite pictures ever of Adam and I. He was such a good sport this day. I wanted some pictures of us together, so we went out on this bright day and took pictures. For this one I made him lay down on the soccer field with me, which he thought was stupid, but he was a good sport about it. 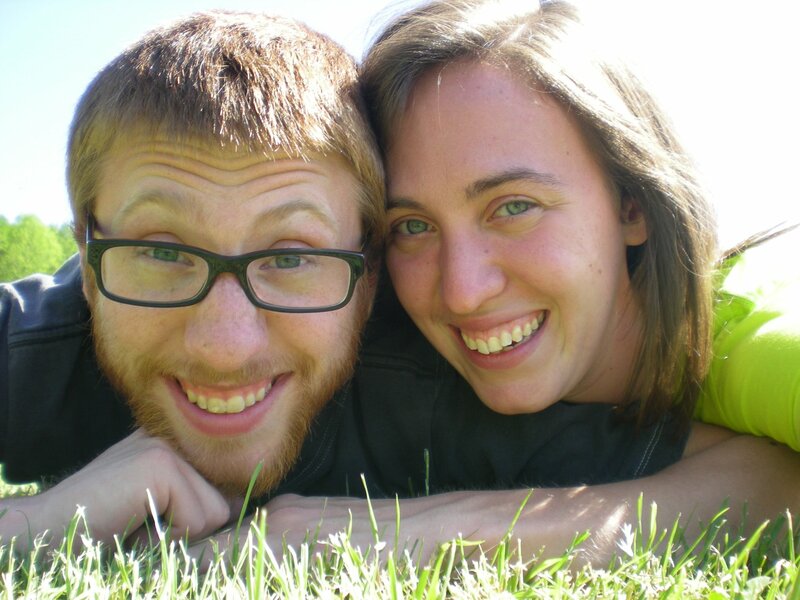 We took several pictures that day, but this one is my favorite, and is still a very favorite of both of us together. This is me and Janna at the rehearsal for my wedding. Janna has been my friend for as long as I can remember. And we only lived close to each other for a small chunk of our lives, but somehow we have stayed friends, and I am so thankful for that. Throughout our entire friendship we only had two fights. One was a silly fight about a boy, and one was over this little purple guy. Janna and I were little and at a garage sale. We both found something that we wanted–Mr Fuzzy, who is holding a sign that says “Hang in there.” My mom said Janna was the guest and so she got to keep it. I was so mad. A few years later I found out that my family was going to be moving away, I was devastated. My going away present from Janna was the little purple guy. Over the years whenever I would look at him on my shelf I would think of Janna and our friendship. 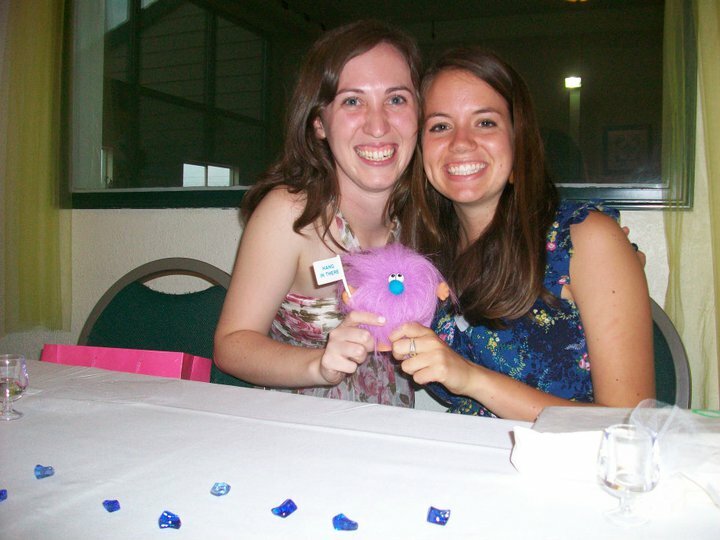 When I was trying to figure out what gifts I was going to give my bridesmaids, I knew that I was going to give the little guy back to Janna. Who knows how many more times he’ll be passed along over the coming years, but that is one of my favorite stories behind a picture. If you didn’t know the story behind this picture you would just think we holding some weird purple guy, but knowing the story makes it so much better-at least in my eyes. Snow Day! and a Link Up! Good morning everyone, it is a beautiful snowy day here in Tennessee. Yesterday my office closed at noon and today it is closed all day! Today I’m going to be linking up with Lauren and Hayley and The Girl Between the Lines again. I’m really excited about today’s prompt. We all imagine what our lives would be like when we were “all grown up”…how does that compare to what your life looks like now? Everyone plans and dreams about the future. I remember planning my future in a rather silly way when I was in elementary school. 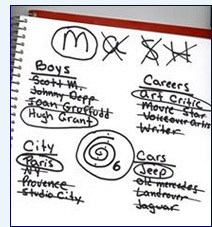 I would gather around with a bunch of my friends on the bus or at recess, or during class when we weren’t supposed to, and play MASH. Anyone else remember this game? It was pretty complex and took a lot of time, but in the end, you would find out whether you would live in a Mansion, Apartment, on the Street, or in a House. And you would know who you would share it with, how many kids you would have, pets, any number of things. I know that my future was planned probably 100 different ways using the MASH technique. Kids have all sorts of games like this that plague their time and thoughts. We all want to dream about what our lives will look like in the future. I have a book that I filled out when I was very little and one of the questions in it was, “What do you want to be when you grow up?” Do you want to guess what I wrote? A window washer. What? Yeah, that’s what I said. A window washer. Yeah, I don’t know where that came from either. Our plans and dreams for the future are vast and changing by the minute. I know that over the course of my (so far rather short) life I have had many plans and dreams about my future. And while some of them come true, I have found that most of my dreams and expectations have not come true, and that is not necessarily a bad thing. Some of the things I thought I always wanted are not really what are important to me anymore, so I am glad that they did not come true. Am I where I always planned and dreamed I would be? No. Am I thankful for where and I am and what my life looks like? Yes. Do I sometimes get wrapped up in the dreams and plans that didn’t come true? Yes. Would I want to change it? Sometimes I get caught up in discontent and think that everything should be different, and the way that I want it, but at the same time I know that the reason I’m am where I am is because God has directed it and placed me here, and he must have a reason for that. So while right now I may not have or be doing everything I thought I wanted, I am where God wants me, and maybe one day he’ll let me see some of my own dreams come true. I’ll just have to wait and see. I may not be a billionaire window washer who lives in a Mansion with 5 kids, a red convertible, a basketball player husband, and a pet penguin, but I am a very blessed financial aid counselor, who has a roof over her head, a car that runs, an all star husband, with the promise of an amazing future, and an awesome God. What more could I want? Today I am once again linking up with The Girl Between the Lines. I have to say, I have really been enjoying linking up with these ladies and having a lot more blogs to read. I had a very hard time coming up with just one person to brag on, so I chose three. These three people are the people that I am closest to. They are amazing, God loving people. God created them all with amazing attributes, but here is just one thing that I admire about each of them. If you know my sister, you know that she is an amazing piano player. But let me tell you a secret, she has to work at it. Amanda practices more hours in a week than I do just about anything else. She is always practicing. Amanda is always saying “no” because she has to practice. I admire that about her. She is dedicated to playing the piano. And I think it shows. I have seen an amazing increase in her talents and abilities while she has been at Milligan, and that is because she is more dedicated to it than ever. I wish I could be as dedicated to something as Amanda is to the piano. 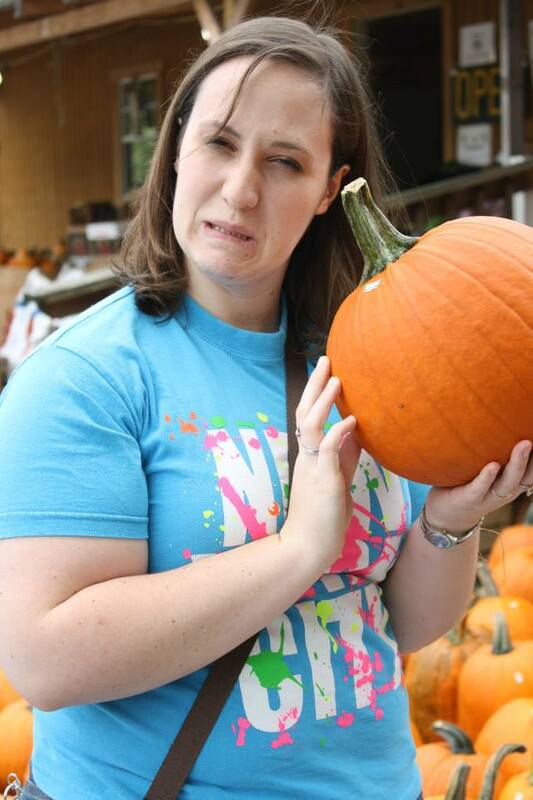 This photo is from one time where I got her to go take a break and carve pumpkins with me, and what did she carve? A piano keyboard. Now that’s dedication. When I say openness, what I really mean is ability to speak his mind in any situation. And if you know Adam you know he always has an opinion, and you always know what it is. That is something that I really admire about him. Adam is not afraid to speak his mind, he is not concerned about what people might think of him. Oftentimes I will not speak my mind because I am afraid that people will not agree with me, or I second guess myself. Adam is sure of himself. That is something I think is very admirable. And he also knows how to control it. He is not afraid to speak his mind, but he also realizes the power in that. I really admire Adam for his openness. 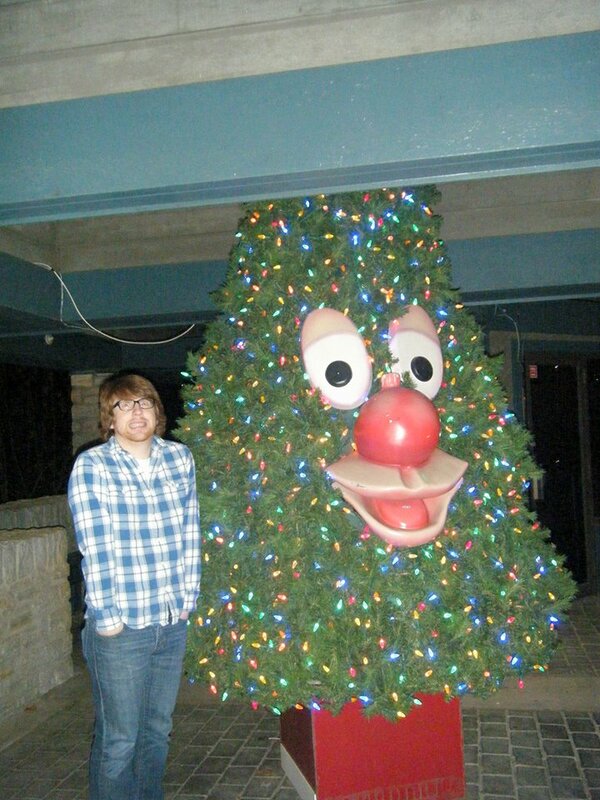 I chose this picture of Adam because we were out looking at Christmas lights with my family and we saw this scary looking Christmas tree. Adam said it was scary and so he went and stood next to it making this face. To me that is openness. When I think of one attribute that I would use to describe Lauren, it would be joy. She finds the good in any situation, which I think comes from having joy in your life. I really admire Lauren’s ability to have joy in every situation. She finds the good where others might see the bad. And a great thing about this is that joy and that goodness comes from her love of the scriptures. It is contagious when I am around her. Along with that joy in her life, comes her ability to be an amazing encourager. At the root of many of Lauren’s amazing attributes is her joy, which is what I admire most about her. I chose this picture of Lauren because, while you might not see it here, you will never know the joy that Lauren gets from a Nerf war. 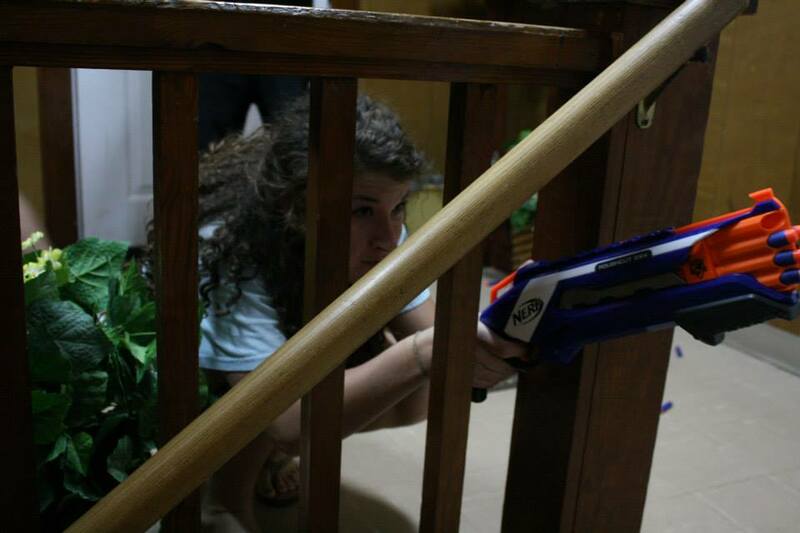 Joy in all things, even Nerf wars. I don’t know about you, but going through this exercise today is going to make me look at everyone a little differently and appreciate the attributes that God has given them. One of my projects that I did this year was make an index card for every meal that I make and want to try. I then made up two separate binders to hold these cards in, our favorites, and other recipes. This has saved me so much time when menu planning and made it so much easier, which is a great thing for me because I hate menu planning. Some of the recipes in the favorites binder that we have most frequently are: Cheeseburger Soup, Chicken Tortilla Soup, and Chicken Cheese Croissants. These are some of the meals that we really enjoy and are pretty easy to make. But I can honestly say, and Adam would tell you this as well, that my go-to meal is Pancakes. (I’m a big breakfast for dinner kind of person). If I mess up on the meal planning and need another meal=Pancakes. If I can’t find another meal to make=Pancakes. If we just aren’t feeling the meal planned for that night=Pancakes (or pizza). In general, we probably have pancakes once a week, because they are a quick, easy solution to menu planning. Mix together dry ingredients and wet ingredients separately and then combine. 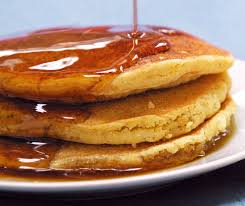 Heat a skillet to medium heat, pour batter on the skillet, flip when there are lots of bubbles on your pancake. Eat as they are ready, or heat the oven to 250 degrees and keep pancakes warm to eat together. Mmmm this makes me want to have pancakes for dinner! or the time that Adam and I bought a Christmas tree too big for our apartment and the top was tilted against the ceiling. or all the terrible pictures of me opening presents in the morning in my pajamas with some glamorous bed head. Making memories is easiest during the holidays because you are with your family and crazy things happen. Things go wrong, plans get changed, but it doesn’t matter because you are with your family celebrating Jesus’ birth. I love the warmth and love that surrounds the holidays. There is just nothing quite like it.